Carry your favorite tea with you wherever you go with this great little tea bag wallet! Sewn with a beautiful teal batik fabric. Closes with a button and elastic closure. This tea bag wallet holds 6 bags of your favorite tea and folds up into a compact 3.5 x 4 inch pouch. Just pop into your purse or travel bag and you are ready to enjoy your favorite cup anywhere. Also great to carry sugar packets or wet wipe packets! Great stocking stuffer, Secret Santa gift, co-worker or teacher gift. Approximately 8.5 x 10 when not folded. Hand crafted in my pet free/smoke free studio in the USA. Oriental Tea Bag Wallet Tea Bag Holder Tea by twistedsticks SOLD! 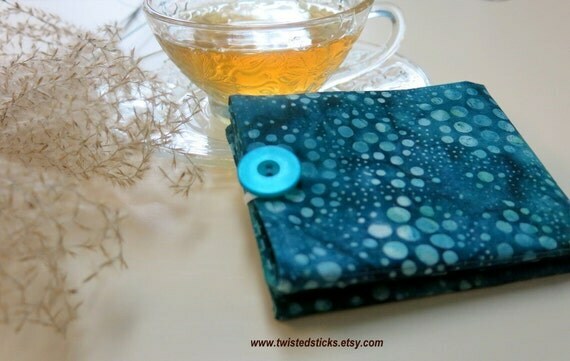 Wallet for Tea Bags Tea Bag Holder Bi Fold Wallet by twistedsticks SOLD! Quilted Baby Blanket Reversible Baby Blanket by twistedsticks SOLD! Valentine Pot Holders Heart Pot Holders Black and by twistedsticks SOLD!